The cherry blossom is commonly celebrated by eating and drinking under the trees while enjoying the return of warmness. But even busy people can enjoy them by going at evening to one of the numerous lightups organized at this season. The whiteness of the 'sakura' even get stronger on a dark blue background ! 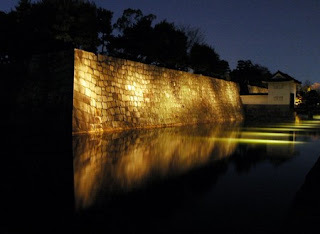 I went recently to enjoy the light up of the Nijo castle and Gion in Kyoto. The second one has ended yet but the first one will last until April 17th, from 18:00 to 21:30. 400 yen per person but free if you come wearing a japanese kimono ! There is a lot of small events organized too and I could enjoy a concert of taiko and one of koto (picture above). Zenzai (sweet soup of beans and mochi), dango (caramelized pasted rice), amazake (sweet sake), ... are here to help you to fight the coldness of night. 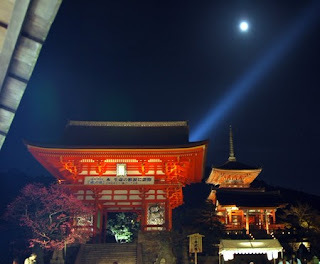 Right after the lightup of Gion starts in the same area the one of Kiyomizudera temple. Actually the gate of this temple was already magnificently illuminated during the lightup of Gion. 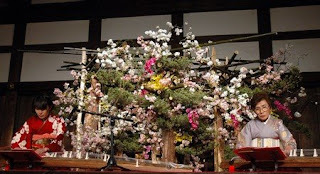 From March 29th to April 10th (18:30-21:30) the whole temple will be enlighted. Don’t believe one optimistic word from any public figure about the economy or humanity in general. They are all part of the problem. Its like a game of Monopoly. In America, the richest 1% now hold 1/2 OF ALL UNITED STATES WEALTH. Unlike ‘lesser’ estimates, this includes all stocks, bonds, cash, and material assets held by America’s richest 1%. Even that filthy pig Oprah acknowledged that it was at about 50% in 2006. Naturally, she put her own ‘humanitarian’ spin on it. Calling attention to her own ‘good will’. WHAT A DISGUSTING HYPOCRITE SLOB. THE RICHEST 1% HAVE LITERALLY MADE WORLD PROSPERITY ABSOLUTELY IMPOSSIBLE. Don’t fall for any of their ‘humanitarian’ CRAP. ITS A SHAM. THESE PEOPLE ARE CAUSING THE SAME PROBLEMS THEY PRETEND TO CARE ABOUT. Ask any professor of economics. Money does not grow on trees. The government can’t just print up more on a whim. At any given time, there is a relative limit to the wealth within ANY economy of ANY size. So when too much wealth accumulates at the top, the middle class slip further into debt and the lower class further into poverty. A similar rule applies worldwide. The world’s richest 1% now own over 40% of ALL WORLD WEALTH. This is EVEN AFTER you account for all of this ‘good will’ ‘humanitarian’ BS from celebrities and executives. ITS A SHAM. As they get richer and richer, less wealth is left circulating beneath them. This is the single greatest underlying cause for the current US recession. The middle class can no longer afford to sustain their share of the economy. Their wealth has been gradually transfered to the richest 1%. One way or another, we suffer because of their incredible greed. We are talking about TRILLIONS of dollars which have been transfered FROM US TO THEM. All over a period of about 27 years. Thats Reaganomics for you. The wealth does not ‘trickle down’ as we were told it would. It just accumulates at the top. Shrinking the middle class and expanding the lower class. Causing a domino effect of socio-economic problems. But the rich will never stop. They just keep getting richer. Leaving even less of the pie for the other 99% of us to share. At the same time, they throw back a few tax deductible crumbs and call themselves ‘humanitarians’. Cashing in on the PR and getting even richer the following year. IT CAN’T WORK THIS WAY. Their bogus efforts to make the world a better place can not possibly succeed. Any 'humanitarian' progress made in one area will be lost in another. EVERY SINGLE TIME. IT ABSOLUTELY CAN NOT WORK THIS WAY. This is going to end just like a game of Monopoly. The current US recession will drag on for years and lead into the worst US depression of all time. The richest 1% will live like royalty while the rest of us fight over jobs, food, and gasoline. So don’t fall for any of this PR CRAP from Hollywood, Pro Sports, and Wall Street PIGS. ITS A SHAM. Remember: They are filthy rich EVEN AFTER their tax deductible contributions. Greedy pigs. Now, we are headed for the worst economic and cultural crisis of all time. Crime, poverty, and suicide will skyrocket. SEND A “THANK YOU” NOTE TO YOUR FAVORITE MILLIONAIRE. ITS THEIR FAULT. I’m not discounting other factors like China, sub-prime, or gas prices. But all of those factors combined still pale in comparison to that HUGE transfer of wealth to the rich. Anyway, those other factors are all related and further aggrivated because of GREED. If it weren’t for the OBSCENE distribution of wealth within our country, there never would have been such a market for sub-prime to begin with. Which by the way, was another trick whipped up by greedy bankers and executives. IT MAKES THEM RICHER. The credit industry has been ENDORSED by people like Oprah Winfrey, Ellen DeGenerous, Dr Phil, and many other celebrities. IT MAKES THEM RICHER. Now, there are commercial ties between nearly every industry and every public figure. IT MAKES THEM RICHER. So don’t fall for their ‘good will’ BS. ITS A LIE. If you fall for it, then you’re a fool. If you see any real difference between the moral character of a celebrity, politician, attorney, or executive, then you’re a fool. No offense fellow citizens. But we have been mislead by nearly every public figure. WAKE UP PEOPLE. THEIR GOAL IS TO WIN THE GAME. The 1% club will always say or do whatever it takes to get as rich as possible. Without the slightest regard for anything or anyone but themselves. Reaganomics. Their idea. Loans from China. Their idea. NAFTA. Their idea. Outsourcing. Their idea. Sub-prime. Their idea. High energy prices. Their idea. Obscene health care charges. Their idea. The commercial lobbyist. Their idea. The multi-million dollar lawsuit. Their idea. The multi-million dollar endorsement deal. Their idea. $200 cell phone bills. Their idea. $200 basketball shoes. Their idea. $30 late fees. Their idea. $30 NSF fees. Their idea. $20 DVDs. Their idea. Subliminal advertising. Their idea. Brainwash plots on TV. Their idea. Vioxx, and Celebrex. Their idea. The MASSIVE campaign to turn every American into a brainwashed, credit card, pharmaceutical, love-sick, celebrity junkie. Their idea. All of the above shrink the middle class, concentrate the world’s wealth and resources, create a dominoe effect of socio-economic problems, and wreak havok on society. All of which have been CREATED AND ENDORSED by celebrities, athletes, executives, entrepreneurs, attorneys, and politicians. IT MAKES THEM RICHER. So don’t fall for any of their ‘good will’ ‘humanitarian’ BS. ITS A SHAM. NOTHING BUT TAX DEDUCTIBLE PR CRAP. In many cases, the 'charitable' contribution is almost entirely offset. Not to mention the opportunity to plug their name, image, product, and 'good will' all at once. IT MAKES THEM RICHER. These filthy pigs even have the nerve to throw a fit and spin up a misleading defense with regard to 'federal tax revenue'. ITS A SHAM. THEY SCREWED UP THE EQUATION TO BEGIN WITH. If the middle and lower classes had a greater share of the pie, they could easily cover a greater share of the federal tax revenue. They are held down in many ways because of greed. Wages remain stagnant for millions because the executives, celebrities, athletes, attorneys, and entrepreneurs, are paid millions. They over-sell, over-charge, under-pay, outsource, cut jobs, and benefits to increase their bottom line. As their profits rise, so do the stock values. Which are owned primarily by the richest 5%. As more United States wealth rises to the top, the middle and lower classes inevitably suffer. This reduces the potential tax reveue drawn from those brackets. At the same time, it wreaks havok on middle and lower class communities and increases the need for financial aid. Not to mention the spike in crime because of it. There is a dominoe effect to consider. IT CAN'T WORK THIS WAY. But our leaders refuse to acknowledge this. Instead they come up with one trick after another to milk the system and screw the majority. These decisions are heavily influensed by the 1% club. Every year, billions of federal tax dollars are diverted behind the scenes back to the rich and their respective industries. Loans from China have been necessary to compensate in part, for the red ink and multi-trillion dollar transfer of wealth to the rich. At the same time, the feds have been pushing more financial burden onto the states who push them lower onto the cities. Again, the hardship is felt more by the majority and less by the 1% club. The rich prefer to live in exclusive areas or upper class communities. They get the best of everything. Reliable city services, new schools, freshly paved roads, upscale parks, ect. The middle and lower class communities get little or nothing without a local tax increase. Which, they usually can't afford. So the red ink flows followed by service cuts and lay-offs. All because of the OBSCENE distribution of bottom line wealth in this country. So when people forgive the rich for their incredible greed and then praise them for paying a greater share of the FEDERAL income taxes, its like nails on a chalk board. I can not accept any theory that our economy would suffer in any way with a more reasonable distribution of wealth. Afterall, it was more reasonable 30 years ago. Before Reaganomics came along. Before GREED became such an epidemic. Before we had an army of over-paid executives, bankers, celebrities, athletes, attorneys, doctors, investors, entrepreneurs, developers, and sold-out politicians to kiss their asses. As a nation, we were in much better shape. Strong middle class, free and clear assets, lower crime rate, more widespread prosperity, stable job market, lower deficit, ect. Our economy as a whole was much more stable and prosperous for the majority. WITHOUT LOANS FROM CHINA. Now, we have a more obscene distribution of bottom line wealth than ever before. We have a sold-out government, crumbling infrastructure, energy crisis, home forclosure epidemic, 13 figure national deficit, and 12 figure annual shortfall. The cost of living is higher than ever before. Most people can't even afford basic health care. ALL BECAUSE OF GREED. I really don't blame the 2nd -5th percentiles in general. No economy could ever function without some reasonable scale of personal wealth and income. But it can't be allowed to run wild like a mad dog. ALBERT EINSTEIN TRIED TO MAKE PEOPLE UNDERSTAND. UNBRIDLED CAPITALISM ABSOLUTELY CAN NOT WORK. TOP HEAVY ECONOMIES ALWAYS COLLAPSE. Bottom line: The richest 1% will soon tank the largest economy in the world. It will be like nothing we’ve ever seen before. The American dream will be shattered. and thats just the beginning. Greed will eventually tank every major economy in the world. Causing millions to suffer and die. Oprah, Angelina, Brad, Bono, and Bill are not part of the solution. They are part of the problem. THERE IS NO SUCH THING AS A MULTI-MILLIONAIRE HUMANITARIAN. EXTREME WEALTH MAKES WORLD PROSPERITY ABSOLUTELY IMPOSSIBLE. WITHOUT WORLD PROSPERITY, THERE WILL NEVER BE WORLD PEACE OR ANYTHING EVEN CLOSE. GREED KILLS. IT WILL BE OUR DOWNFALL. Of course, the rich will throw a fit and call me a madman.. Of course, they will jump to small minded conclusions about 'jealousy', 'envy', or 'socialism'. Of course, their ignorant fans will do the same. You have to expect that. But I speak the truth. If you don’t believe me, then copy this entry and run it by any professor of economics or socio-economics. Then tell a friend. Call the local radio station. Re-post this entry or put it in your own words. Be one of the first to predict the worst economic and cultural crisis of all time and explain its cause. WE ARE IN BIG TROUBLE.